ted is working pretty well these days. 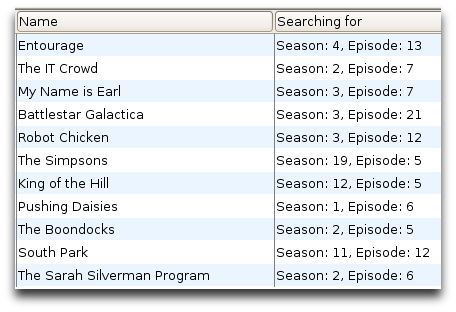 The built-in list of shows isn't very extensive, but it's easy enough to add search feeds from tvrss. I tend to remove the duplicate search feeds from the predefined shows and just use the tvrss ones - it's faster that way. I've also been watching Charlie Brooker's Screenwipe, The Peter Serafinowicz Show and Russell Brand's Ponderland, but they're not in this kind of RSS feed, unfortunately.